Initially promoters of the parliamentary rule in the country, leaders of the Uzbek community of Kyrgyzstan changed their mind not long ago. They now stand for the mixed form of rule where the power balance between the president and the parliament is maintained. They ascribe the change to the latest developments in Kyrgyzstan when the parliament adopted several variants of the Constitution one after another. Here is an interview with Kadyrjan Batyrov, deputy of the Jogorku Kenesh (national parliament) and one of the most active - and therefore disliked by the authorities - leaders of the Uzbek community. Ferghana.Ru: Kadyrjan Alimjanovich, supporters of the powers-that-be blame you for the support of the opposition. The opposition in is turn accuses you and the Uzbek community as such of the support of the powers-that-be (it did so during the last March events). So, where do you stand? Kadyrjan Batyrov was born in Jalalabad on March 9, 1955. 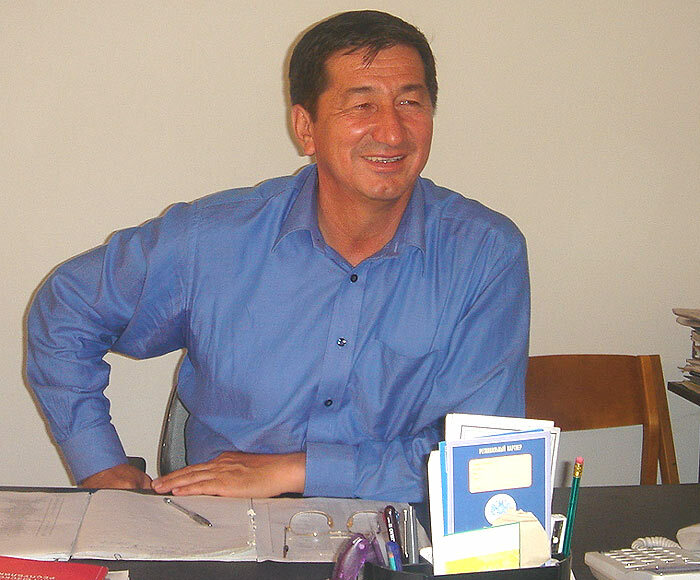 He is a deputy of the Jogorku Kenesh, Vice President of the republican Uzbek Center of National Culture and President of the Uzbek Center of National Culture of Jalalabad. Batyrov sits on the Political Council of Vatan. State Advisor of the 2nd Class, he is President of the private University of International Friendship named after Alim Batyrov. Decorations: medal of Dank (Glory). His companies in the Commonwealth and foreign countries employ more than 2,500. Batyrov is married with two sons and three daughters. Kadyrjan Batyrov: As for me, I have never hesitated to speak my mind on whatever the authorities did in all 15 years of independence of Kyrgyzstan. I even did so in ex-president Akayev's time. The Uzbek Center of National Culture in the Jalalabad region staged numerous protest actions demanding defense of Uzbeks' rights. I'd have been supporter of the authorities, both the previous and current, had they been competent workers, solving problems of the people and performing their functions properly. Unfortunately, that's not what we've been seeing on their part. Ferghana.Ru: You are a member of the Political Council of the Party of People's Unity and Consent. This latter announced the other day that it supports a mixed form of rule. Before that, however, the Uzbek community and you promoted the parliamentary rule. What happened to effect the change? Kadyrjan Batyrov: The Uzbek Center of National Culture convened a rally last May in support of the parliamentary rule. I supported this form of rule too in the November crisis when the Jogorku Kenesh was divided on the matter. When the new Constitution was being adopted, however, I became convinced that neither the Movement For The Reforms nor other forces intend to recognize the fact that the titular nation is not the only one living in Kyrgyzstan, that 80 other ethnic groups live here too. All these forces have found no place for these peoples in the Constitution. In other words, our initiatives promoting the interests of non-titular nations, were absolutely ignored. For example, we suggested in the Constitution a clause permitting ethnic minorities to use their native tongue in compact residence areas. Most lawmakers backed the idea but our initiative never made it to the Constitution all the same. I know now that the reforms are carried out for deputies themselves and not for anybody else. I'm convinced now that neither the Movement For The Reforms nor other "reformers" can be trusted with the future of the country. We came to this conclusion at the congress of our Party of People's Unity and Consent that is now called Vatan. We believe that at this particular point Kyrgyzstan needs the mixed form of rule. It should be a country where the president and the parliament balance each other. Ferghana.Ru: What about the relations between the president and you? They have been fairly cold so far as I know. Ferghana.Ru: And what happened to your property? Kadyrjan Batyrov: The way I see it, the major positive change is that everything is done by the book now. We already won several court battles. The municipal and regional courts backed our claims. The matter will be considered by the Supreme Court now. All the same, I suspect that the local authorities and law enforcement agencies are not doing their job the way it should be done. I mean, they are not taking measures against embezzlers and thieves, against whoever tears apart the seized buildings or reconstructs them. As a matter of fact, many usurpers are already building houses of their own on the seized territories. There was even an episode when the usurpers assaulted and battered the district prosecutor. Law enforcement agencies know the identities of organizers of this lawlessness but remain passive. Instead of dealing with all these facts within the framework of one investigation (they are related after all, everyone can see that), law enforcement agencies treat them as unrelated offenses. I reckon that it is being done deliberately so as to make them seem less important than they really are. Ferghana.Ru: Have you managed to repossess your property? Kadyrjan Batyrov: Much to my regret, I haven't. I counted on the mayor of Jalalabad. I thought he would take measures to restore justice but he never did. He broke his word. When we tried to do something on our own, Mayor of Jalalabad Mamasaliyev and his entourage (40 men) paid us a visit. Want to know what they came for? They came to say that we were inciting unrest and disrupting stability! Why wouldn't they tell it to the usurpers? It is nothing short of a crime on the part of the local authorities. Well, Mamasaliyev told us then that he himself would talk the usurpers into leaving the objects they had no rights to and restore order there. He said he needed five days to do so. What he did, however, was make a complaint to the Supreme Court and ask it to overrule the municipal and regional courts that had recognized my rights to the seized objects. I'd like to be there when he makes a report to city dwellers on his performance. I want to listen to what he has to say on this particular subject. Ferghana.Ru: Is there a force in the country that will consolidate constructive efforts? Kadyrjan Batyrov: Sure. The reforms. We've been talking much but doing little. Consider reorganization of local power structures, for example. Once it was installed last March, the new regime announced that regional structures would be abolished within a year. These days, however, the battle is on to preserve them. Local budgets in the meantime are in the hands of thieves and embezzlers. Nobody controls them! It's utter chaos! Moreover, the local authorities are ever busy with petty political intrigues. All they are interested in is having their relatives appointed to prestigious positions and building themselves palatial homes. It is at this particular level that corruption is rooted, at this level and below it. President Kurmanbek Bakiyev himself has said it more than once. These structures are like a constant drain on the people and the budget and therefore must be abolished. Ferghana.Ru: A few words on the ethnic problems, please. Kadyrjan Batyrov: It is political passiveness of ethnic minorities and Uzbeks' in particular that worries me. Worse than that, we have leaders at various levels who are actually dragging the people back or pushing it into an abyss. We should be learning from the Kyrgyzes who are always very active. Politically, that is. This is a people that knows how to fight for its rights and for a worthy place in society. Not so the Uzbeks, who prefer waiting for somebody else to do everything for them. I saw it at meetings with the people, so I know what I'm talking about.